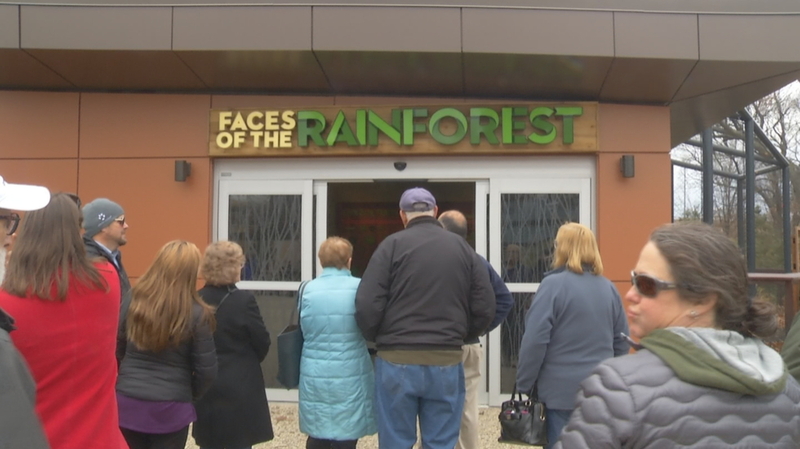 The staff at the zoo cut a ribbon for its new "Faces of the Rainforest" section, which includes a 40-foot-high glass atrium where monkeys and tropical birds can co-mingle. The exhibit also includes a waterfall and pool for Amazonian giant river otters. There will be 44 species in total that will live in the exhibit. According to the zoo, Faces of the Rainforest is the "first major project in phase one of a twenty-year master plan originally unveiled in 2015." Zoo members can go see the exhibit on Saturday and Sunday from 9:00 a.m. to 10:00 a.m. before the doors open to the public. Roger Williams Park Zoo held a press conference Friday to celebrate the grand opening of their new rainforest exhibit.